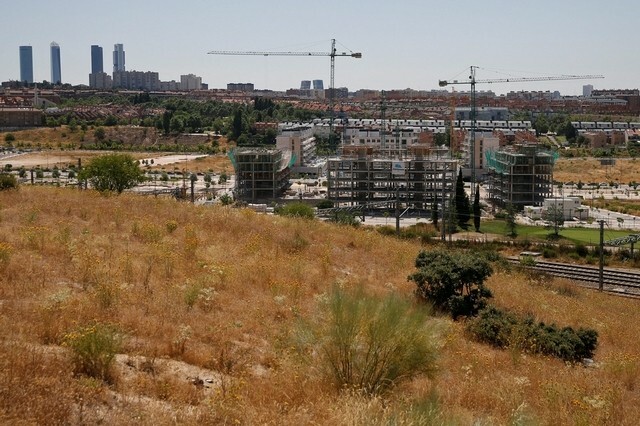 Residential construction is coming back to life in Spain eight years after a property crash, with foreign investment pouring into developments in Madrid and Barcelona, and a jump in building permits pointing to more growth to come. Half a million newly-built homes remain empty after the mania that peaked in 2007, largely on urban fringes and in remoter areas where people do not want to live. But demand for properties ranging from luxury apartments to homes for the middle classes is rebounding in leading cities and industrially-strong regions such as the Basque Country, showing how Spain’s economic recovery is on course despite political paralysis after two inconclusive general elections. Construction and property accounted for more than a third of the nearly €22 billion (Dh88.83bn) of foreign investment in Spain in 2015, economy ministry data shows. Foreign funds desperate for a return on their investments at a time of ultra-low interest rates have flocked to Spain as the 2008 crisis has knocked around 40 per cent off property prices. According to the property portal Idealista, rental yields increased to 6.1 per cent in the second quarter, five times the return on a 10-year government bond. Spain still has no new government, seven months and two elections after the prime minister Mariano Rajoy lost his parliamentary majority, with leading parties so far failing to agree on a coalition. But this does not seem to be discouraging property investors. Madrid ranked fourth in a 2016 league of European cities which PwC compiles, based on a survey of investors’ and developers’ views on which property markets offer the best prospects. The Spanish capital ranked ninth globally in an EY survey which asked property executives where they plan to invest in the next few months. Investments vary widely – from buying blocks of rented apartments to packets of mortgage debt and banks’ property management units. Private equity funds have become the country’s new developers, looking to make profit on residential building given Spain’s fourth year of economic recovery and a lack of suitable property in areas that are in demand. Property consultant CBRE predicts annual demand of 180,000 units over the next 10 years. At the top end, Rockspring is funding a development of a 19th century building on Madrid’s upmarket shopping boulevard Serrano, where the nine apartments range in price from under €2 million to €8m. “By the time we had published the brochure, we had already sold 60 per cent of the apartments,” said Eduardo de Roda, an associate director at Rockspring Iberia. Also at the high end of the market, the US private equity firm Pimco and the local property fund Grupo Lar are investing in a development of around 40 units in central Madrid with a swimming pool and spa, expected to sell from about €3m. At some €10,000 per square metre, these prices are easily on a par with pre-crisis levels. But in international terms they are modest at perhaps one tenth of properties in the best districts of London and a quarter of those in Paris. In contrast to Spain’s boom years, many prospective buyers at the high end of the market in Madrid are wealthy Latin Americans seeking a relatively secure investment, estate agents and developers say.